Fertilizer for Your Mind workshops offer you a safe, caring and supportive way to explore groundbreaking and transformational ideas. At the heart of each workshop is a book written by a renowned expert in his/her field. In an intimate, small-group coaching atmosphere, our approach to each book blends reading and discussions with mindfulness practices, meditation, reflection & journaling, and other tools from positive psychology that have been proven to enhance wellbeing and resilience. You will be encouraged to identify something in the book that speaks the loudest to you, and to find ways to bring those concepts “to life.” This process of reading + sharing + practicing allows you to reach deeper insights about yourself and other humans, and to discover what works best for YOU. Each workshop includes a 30-minute individual coaching session. Actual time commitment will differ for each workshop. Registration is OPEN NOW! Workshop starts June 19, 2018. Do you sometimes feel like you don’t quite measure up? That no matter how much you do and how hard you try, something isn’t right? If you’d like to learn how to be more self-accepting and create more authenticity in your life – and cope more effectively with shame, vulnerabilities and fear – this book is a wonderful resource. It inspired and enlightened me on my personal journey, and I’d like to share it with you. 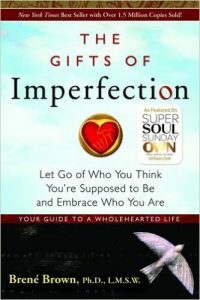 The Gifts of Imperfection – Brene Brown, Ph.D., L.M.S.W. In this early book (2010), Dr. Brown addresses how we buy into other people’s ideas of who we should be – often without even realizing what is happening. She addresses feelings of shame and unworthiness – and provides 10 guideposts to what she calls “Wholehearted Living.” Her poignant and heartfelt stories are relatable to all of us. This is a book best read slowly, with time to contemplate, process and integrate her insights into our daily lives. As I re-read this book, I am reminded of the Japanese art of Kintsugi – the centuries-old practice of fixing broken pottery using gold, silver or platinum. Why do they do this? To honor the unique history of the piece by emphasizing the fractures instead of hiding them. 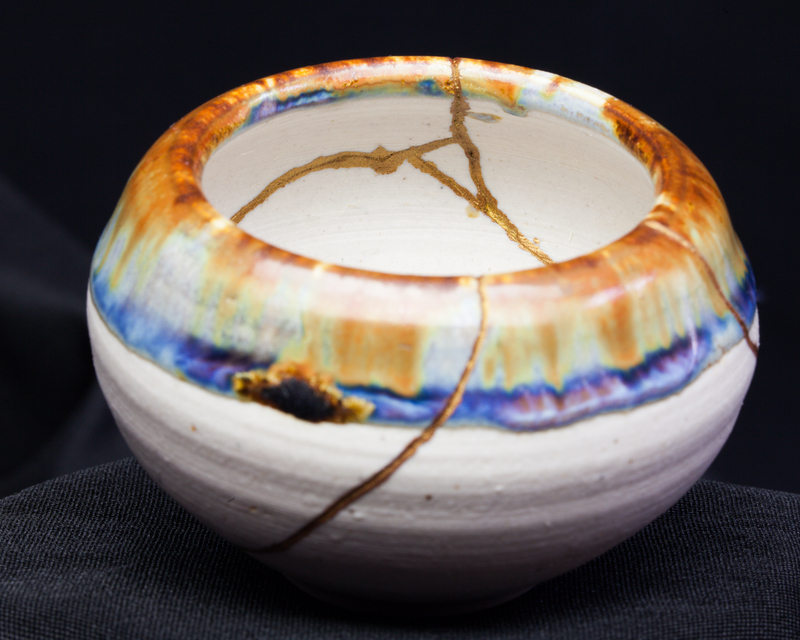 They see the pottery as being stronger and more beautiful for having been broken. We will use this book as a jumping-off point to explore our inner worlds further as we grow stronger and work to live more in tune with who we are – embracing and integrating our imperfections. Join us. The group will be kept small – no more than 10 people. Come to share or come to listen – the choice is always yours. A commitment to all 4 sessions is requested (We will NOT be meeting July 3!). We will be meeting on Tuesday evenings, 6:00 – 7:30 pm on June 19, June 26, July 10 and July 17. Early bird registration is $45; if you register after June 15 it is $60.00 REGISTER NOW! This book is available for purchase at Amazon and Barnes and Noble. 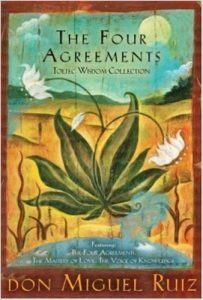 A Toltec Wisdom book, the author addresses self-limiting beliefs and offers a code of conduct that consists of Four Agreements. This book may be small – but it is mighty. The concepts are clearly and succinctly expressed – and very deep. For many, this little book has been a major life-changer. We will spend some time looking at each agreement. How do they relate to our lives? What might change for us if we followed them? We’ll also take a look at the Toltec Wisdom traditions – and explore the value they have in today’s world. Do they still speak to us? Join us for a philosophical discussion. Stay tuned for more details, including dates and meeting times! First published in 1959, this book is a classic. Between 1942 and 1945, Dr. Frankl labored in four different concentration camps. This is his story. 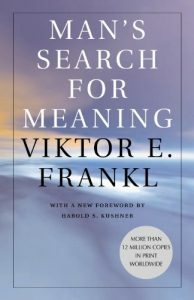 A story of his time in prison, his observations, and how his experiences led him to conclude that “meaning” is the primary human drive – not pleasure as had been suggested by Freud. From his experiences in the camps, he developed a theory of human behavior (logotherapy), planting some of the first seeds for the field that is now called positive psychology. Join us in a philosophical and educational discussion of Frankl’s life and work as we look for ways his experiences in the concentration camps of Nazi Germany and his subsequent insights into human behavior can help us in our lives today. This workshop will bring in related research from social psychology that supports or challenges some of his observations and conclusions – including some studies that have surprising and controversial outcomes. How did he come to believe that humans are motivated by a “will to meaning” and that life has meaning under all circumstatnces, even the most miserable ones? Let’s find out. New group started in November – Sorry we missed you! Investment for this 5-week, 7.5 hour workshop is $125. A committment to all 5 weeks is requested. Registration is currently closed. If you are interested in this program and would like to hear about future dates, please email Linda or call 610.222.0700 and leave a message! It would be great to know your preferred days and times as we look toward future schedules. The book is available for purchase at Amazon and Barnes and Noble. 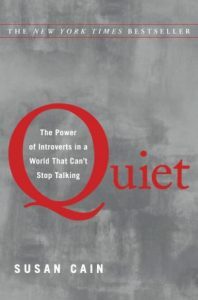 Did you know that at least one-third of the people in the U.S. are introverts? Yup. And I’m one of them (your friendly workshop leader, Linda) – although you won’t know it when we meet. In this workshop, we’ll learn to appreciate and grow our own, unique gifts.